Please see the Twitter feed on the Home page! Welcome to the Residential updates page. 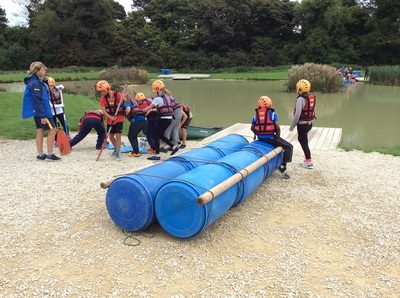 Here, you'll be able to find lots of information about the activities our current group of year 6 children got up to on their week away at PGL in Liddington, as well as lots of photos from the week and some recounts from the children themselves. Monday - the adventure begins! The children were dropped off at the gates with suitcases full to bursting and dreams of adventure in their hearts. These dreams were quickly shattered as Mr Gould embarked upon another one of his "short" speeches about teamwork, bonding and challenge! 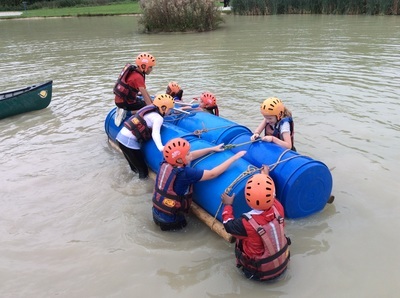 After sorting the children out into their day groups, they began to tackle a short series of problem solving activities in the hope that the team-building process could begin without delay. Unfortunately, the coach that would whisk them away to the Vale of the White Horse arrived and it became time to leave. Upon arriving at their scheduled stop at Uffington Castle, the children were able to stretch their legs and get a good lungful of fresh (albeit cold and exceptionally windy) air before sitting down to refuel with packed lunches. Back on the coach. The children were eager to finally arrive at the centre and find out which room they would be in and with whom. 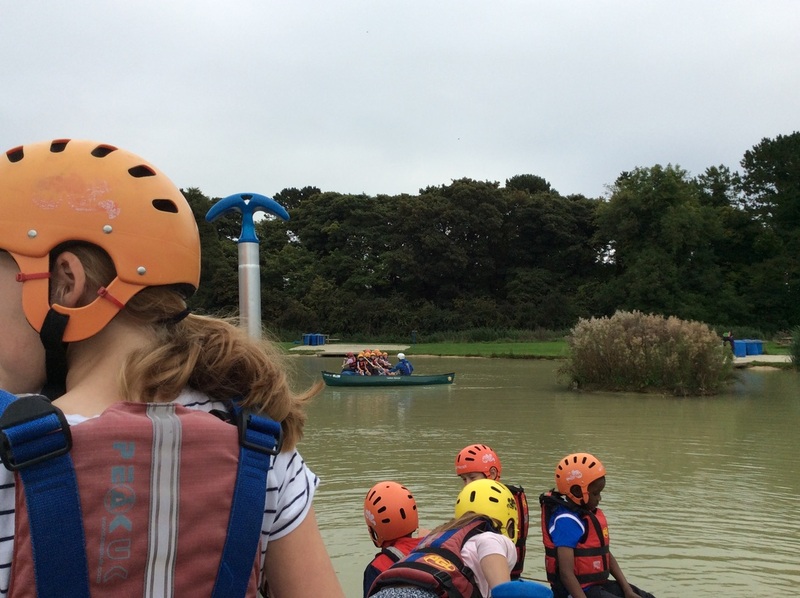 The group's PGL leader Grace was ready to meet the children and took them on a brief tour of the site. They saw the dining hall, rooms, activity areas and were talked through a fire walk, in which they were shown where to go in the event of an alarm. After a delicious meal complete with raspberry doughnut for desert, the children took part in a quiz show. It was a close call between the six teams, but the OAPs (obnoxiously awesome peeps) just managed to edge the win. The children were safely tucked up and ready for a restful night's sleep by 9:30pm and all seemed quite and peaceful along the corridor. The gentle snores and hushed murmurings of sleep were suddenly destroyed by the shrieking howl of the fire alarm at 11:30pm; "Don't worry," said Grace. "We're not scheduled for a drill." The children and adults were suitably surprised and blearily eyed but did brilliantly by getting up and out of the corridor and to the safe location quickly. Some were a little chilly in the slippers and PJs but none came to any harm. They later found out that it was a fault in the kitchen and have been assured that it won't happen again. They have their fingers crossed. The children returned to sleep quickly with dreams of zip wires, climbing walls, canoeing and archery running through their heads in anticipation of their first full day at PGL Liddington. Day two: Abseiling, Archery and Ambush! Tuesday saw the groups first full day of activities, but not before the children had had a chance to fill up on a hot breakfast, cereals, fruit and toast. Room inspection was next as the group returned from the dining hall. Parents may be surprised to hear that all room were tidy, beds were made and clothes had been folded away. As the group crossed back over to switch with Mrs Chende's group, who had been open canoeing, they noticed that at least one of the children (Miss Spokes) had rather soggy legs. Determine not to take a dip themselves, the group paid super attention to the PGL leader and were rowing like pros in no time. After catching up with the other two groups, who had also been zip-wiring and canoeing, it was time for lunch. Hot soup, baguettes, wraps and a selection of fillings made sure that everyone had the chance to get properly refuelled before getting back out for the afternoon's activities. 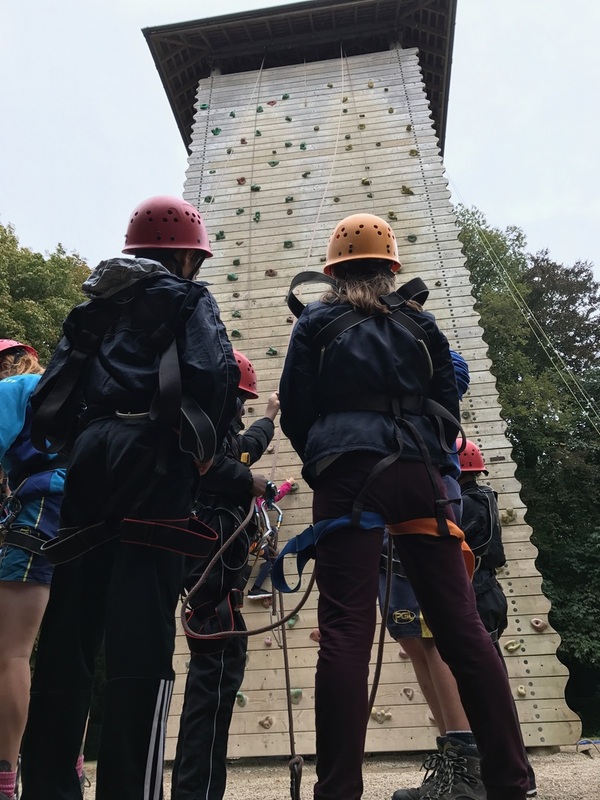 The climbing wall loomed ominously in front of the children as they prepared themselves by getting strapped into their harnesses and helmets. Whilst some children made the ascent to the summit, other groups were making sure their arrows hit the target in archery. 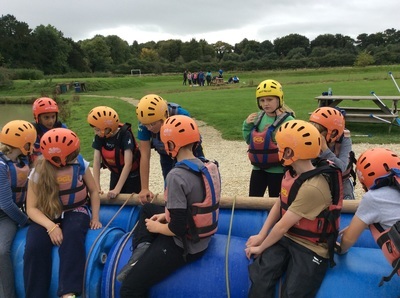 A quick swap after each session meant that everyone had survived their first full day of activities with a smile on their faces and some excellent memories to take away. After an excellent and well needed dinner, the group got ready for their evening's entertainment: ambush! Group hide and seek in the dark - an event the children will be talking about for some time to come. Thirty eight tired and weary, but very happy, children made it back to the rooms and settled down for sleep. Another bumper packed day lies in store for them on Wednesday. For my second activity of the day, my group did climbing. 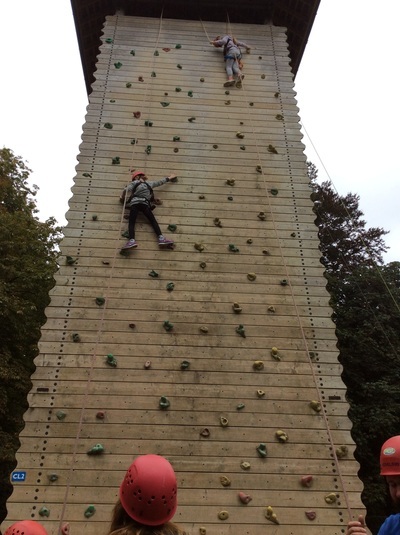 We all were a little scared because we heard that it was as tall as the zip wire (about 12 metres). To get there, we went through a mini forest and in a short amount of time, we arrived. It was huge! Our instructor told us what to do and everyone got ready. We had to put on helmets, harnesses and put our bags in a little shed. Now we were ready! I went first with two other people. It was slightly scary but we had people to keep us safe. It was really amazing and everyone had a lot of fun. When the fun was over, all nine of us went back to the waiting area to go to lunch. Written by Lily Howard, Panthers. The children enjoyed an evening's entertainment in front of a campfire singing songs whilst marshmallows were toasted for them. There's lots more in store for the children for their penultimate day away before returning home on Friday.